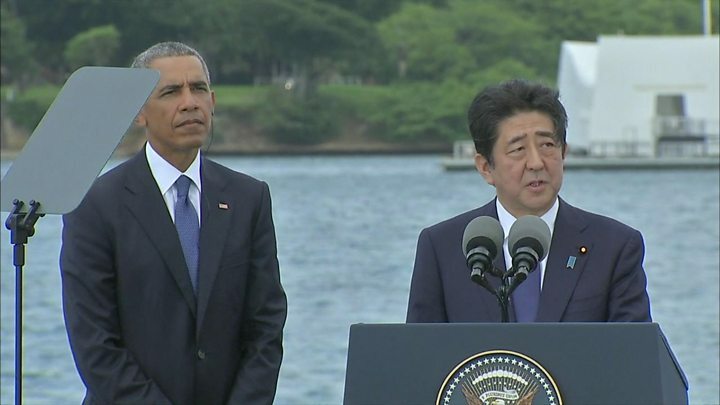 Media captionJapanese PM Shinzo Abe: "Sincere and everlasting condolences"
Japanese PM Shinzo Abe has visited the US naval base at Pearl Harbor, where he offered "sincere and everlasting condolences" to the victims of Japan's attack on the base 75 years ago. "We must never repeat the horrors of war again, this is the solemn vow the people of Japan have taken," he said. Mr Abe was accompanied by US President Barack Obama, making the visit the first by the leaders of both countries. Japan devastated much of the base, killing more than 2,400 Americans. 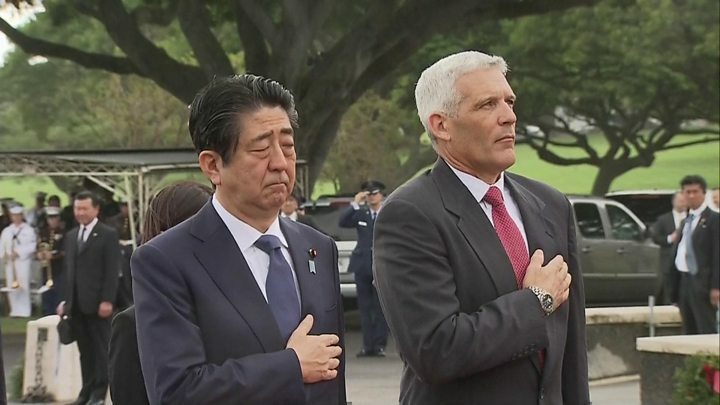 Mr Abe paid tribute to the men who lost their lives in 1941 at the naval base, many of whom remain entombed in the wreckage of the USS Arizona, sunk by the Japanese that day, and vowed reconciliation and peace. "To the souls of the US servicemen who lie aboard the USS Arizona, to the American people, and all people around the world, I pledge that unwavering vow," he said. The Japanese prime minister went on to praise the US for its efforts to mend relations with Japan following the war between the two countries, which ended shortly after the US dropped two atomic bombs on Japan in August 1945. And he called the renewed alliance between the countries an "alliance of hope". Mr Obama also paid tribute to the dead, saying that he had laid a wreath on "waters that still weep". "That morning the ranks on those men's shoulders reflected them less than the courage in their hearts," he said. He said he welcomed Mr Abe "in the spirit of friendship, in the manner Japan has always welcomed me". Mr Abe is the first Japanese leader to visit the memorial on the site of the Arizona, although several of his predecessors have been to Pearl Harbor in the past. He and Mr Obama laid wreaths at the site and the two leaders prayed for the dead. But, as expected, Mr Abe did not issue an apology for the attack. Japan's surprise attack on Pearl Harbor damaged all eight of the US battleships at the base and sank four of them, propelling the US into World War Two. Nearly half of those killed were on the Arizona and the remains of most are still entombed in the wreckage. All eight battleships at the base were damaged and four were sunk. But the key US aircraft carriers were at sea at the time. On Monday, Mr Abe visited the National Memorial Cemetery of the Pacific and laid a wreath. He stood for a moment of silence at the cemetery near central Honolulu, a memorial to those who died the the Pacific theatre of war. He also held a summit meeting with Mr Obama in Hawaii, their last before Mr Obama steps down in January. Mr Abe's visit, three weeks after the 75th anniversary of the attack, follows a visit earlier this year to Hiroshima by Mr Obama. He became the first serving US president to visit the Japanese city, where about 150,000 people are believed to have been killed in 1945 by a US atomic bomb. The first Japanese leader to visit Pearl Harbor was Shigeru Yoshida who in 1951 stopped over in Hawaii both on the way to and from the signing of the peace treaty with the US in San Francisco. Reaction: 'Symbolic reciprocity' or 'wrong reconciliation'? The visit has drawn positive comments in Japanese media. The daily Asahi Shimbun calls it "an act of symbolic reciprocity" coming six months after US President Barack Obama's visit to Hiroshima. It also notes: "Obama did not apologise at Hiroshima. Nor did Abe." The leading Kyodo news agency observes that wartime survivors have mostly "welcomed Abe's condolences" but some have wondered why he did not apologise outright. The Japan Times is mindful of criticism in China, noting Beijing's insistence that "Japan must first reconcile with parts of Asia victimised by its wartime aggression". The Global Times in China reiterates the point in an editorial, saying that Mr Abe has picked "the wrong place and wrong direction if he is sincere in seeking reconciliation over historical issues". "He should have come to places like Nanjing, the Marco Polo Bridge in Beijing, or the South Korean capital, Seoul. There are many venues there for him to commemorate," it adds. His visit on the way home included a meeting with the commander of the US Pacific fleet, Admiral Arthur Radford. The office where the two men met offered a direct view of the site of the Japanese attack. "I could almost see the wreck of Arizona" out of the window, Mr Radford later wrote in his memoir, referring to a battleship that sank in the attack. He recalled the meeting as having been initially rather awkward until his dog walked over to the Japanese visitor to be patted, breaking the ice between the two former enemies.